The Comfort Revolution Hydraluxe Plush Cooling Pillow features a cooling fiber that allows air circulation for a cool night's sleep. Lofty fiber is treated with a phase change material and gel. Creates a sustained cooling sleep surface that reduces tossing and turning due to heat build-up. This product includes a 100% polyester fill and 100% cotton cover. The Hydraluxe Air Cooling Fiber Bed Pillow is fluffy and supportive. The Hydraluxe Plush Jumbo Cooling Pillow F01-00359-ST3 has many exciting features for users of all types. See the Hydraluxe Plush Jumbo Cooling Pillow F01-00359-ST3 gallery images above for more product views. 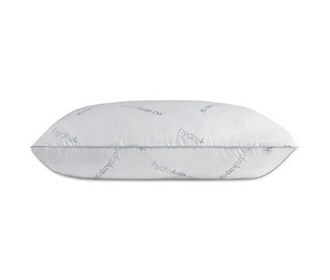 The Hydraluxe Plush Jumbo Cooling Pillow F01-00359-ST3 is sold as a Brand New Unopened Item.